Tomatoes love humus and nutrient rich soils with good water retention. They also prefer locations with sufficient heat and sunlight. 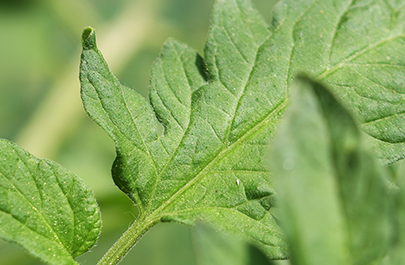 Tomatoes require a lot of water, but excess rainfall increases the risk of leaf disease. Therefore, tomatoes are mostly cultivated in controlled conditions, under polythene and glass. The root system, which consists mainly of fine roots, is efficient, but since they do not have tap roots, tomatoes cannot be grown on compact or flooded soil. Fertilization in three phases, observe the needs of the crop. Particularly emphasise potassium fertilization from the first to the last harvest. Calcium and magnesium fertilization is important. Economically, tomatoes are the most important vegetables worldwide. As tomatoes tolerate little rainfall yet still require a lot of water, heat and nutrients, cultivation under polythene or glass has proven beneficial. 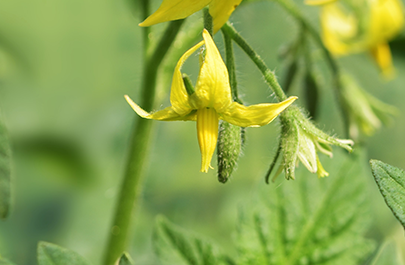 Determinate tomato varieties stop growing after the first flowering season, and indeterminate varieties continuously form additional leaf and shoot mass (up to 15m). There is a raft of tomato varieties available, for different growing times and cultivation methods and for various purposes. Tomatoes, like all nightshades, are susceptible to leaf diseases such as late blight (Phytophthora infestans), velvety blotches, powdery mildew and viruses. 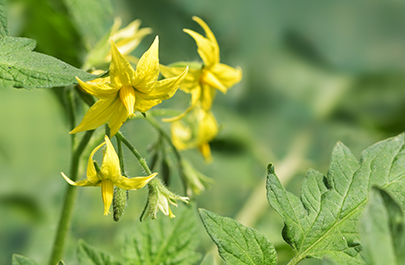 Continuously supplying the tomato plant with water and nutrients for as long as possible during the flowering and harvesting season, is economically crucial. Dry weather and low levels of fungal infection during harvesting are ideal to ensure a good shelf life. Tomatoes are one of the most nutrient-depleting plants, and need a relatively high amount of nitrogen. Excessive amounts of nitrogen can also enhance susceptibility to disease. Due to their high water consumption and high production of mass, they also need large amounts of potash. Symptoms of both deficiency and excess can be easily recognised on the leaves. Light green leaves indicate nitrogen deficiency, whilst dark green leaves indicate nitrogen excess. Narrow, reddish or brownish-purple leaves indicate phosphorus deficiency and wilting and necrosis at the edge of the leaves are the result of potassium deficiency. The biggest challenge is managing a balanced supply to the plant. Tomato fertilization must be calculated in a way that supports continuous growth of new shoots, leaves, flowers and fruits as well as the ripening of already existing fruits. The amount and composition of complex fertilizers must therefore be adapted to the stage of development of the tomatoes. The table shows the uptake and withdrawal of nutrients per tonne of tomato yield. According to this, tomatoes mainly need nitrogen and potassium. Phosphorus, magnesium and calcium must also be present in appropriate amounts. For example, a tomato yield of 150t/ha takes up 440kg N/ha. If 40kg N/ha is supplied by the soil, then 400kg N/ha would need to be fertilized. As both plants and fruit are commonly removed, a total of 400kg N/ha is taken out. When tomatoes are cultivated in the field, a yield of 60t/ha and 20t of plant matter would remove 136kg N, 55kg P2O5, 232kg K2O, 339kg CaO, and 36kg MgO. Under suitable conditions, high-yielding tomato varieties are expected to produce 100-150 tonnes per hectare. Determinate tomato varieties need fertilization to support sustained growth and at the same time the ripening of fruit with high market value. The nitrogen supply must be sufficient for as long as growth continues. However, an excess supply of nitrogen can affect fruit quality and delay ripening. At this stage, ammonium (NH4+) is the preferred nitrogen form. Appropriate phosphorus and potassium levels ensure high quality (taste, colour, firmness and shelf-life). Ensuring the necessary potassium level is important for fruit formation and fruit enlargement. Calcium deficiency induces blight, often as a result of unfavourable summer climates. The optimum pH value of the soil is between 6.5 and 7. Tomatoes are not only sensitive to salt, but also to zinc, iron, boron and manganese deficiencies. Sulphur fertilizer in particular improves the firmness and colour of the fruit. Dose splitting is necessary. The amount of calcium necessary for the tomatoes is applied prior to planting in autumn. Fertigation facilitates the adaption of fertilizer composition and quantity to different growth phases. The amount of shoots per m² and a continuous production of flowers and fruit determine the yield. For this, especially at the beginning, nitrogen and magnesium supply is important. For well-developed tomatoes with a healthy and strong colour and classic taste, it is important to have sufficient potassium, no oversupply of calcium, and sufficient sulphur and water. Tomatoes need relatively little fertilizer at the beginning of their growth. In order to develop a good root system, the supply of nutrients and water is kept to a minimum in the first few weeks. Therefore, only about 1/7 of the amount of nitrogen and phosphorus are allocated to the first batch of fruit. Only 1/13 of the total potassium requirement is given at this stage. The best solution for this administration is a chloride-free NPK fertilizer with emphasis on nitrogen and potash (COMPLEX 15/5/18 + 2.5MgO+25SO3+B+Zn). First flowering phase until the beginning of harvest; increasing demand for balanced fertilization. In this phase, the fruit formation of the tomato, and at the same time, continuous growth and flowering, should be promoted. Therefore, particularly balanced nutrient ratios are necessary. Too much nitrate at this stage is particularly precarious, so ammonium fertilizers are preferred. Magnesium supply also needs to be taken into account at this stage. The same NPK formula is used in this fertilization phase, but the application rate is about three times higher than in the first fertilizer application. Start of harvest until end of crop; full amounts of potassium fertilizer. This is the main fertilization phase for tomatoes. Deficiencies are shown not only by poorly-formed fruits and lack of taste, but also by lower flower bud formation and subsequently low total yield. The potassium requirement ranges up to 500 kg/ha. A continuous dosage of nutrients via irrigation with suitable L.A.T SUPREMO products ensures supply. Fertilization can be stopped about two weeks prior to the end of the harvest. Then the nutrients that are still present in the plants will be sufficient until the ripening of the last fruits.